This weeks want is a blush. I've gone a bit blush mad in the last few weeks, and this one caught my attention. I normally go for pinks and this one is more of a peachy pink. It has a gorgeous golden shimmer in it, so you can skip highlighter. See swatches here for a great review on it and here for a closer look at the golden shimmer. What are you wanting this week? Oh I have this one that I got in an Inika pack ages ago. It's a gorgeous colour but does not suit me at all. Inika products are amazing though! You know, I used to use this before and I loved it! I went through this phase where I had so many Inika products as I was using their foundation! They have such great products. 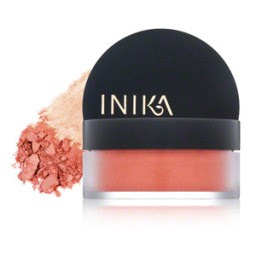 I've not tried the Inika range - must admit I've gone just a little blush crazy too, particularly over creme blushes!